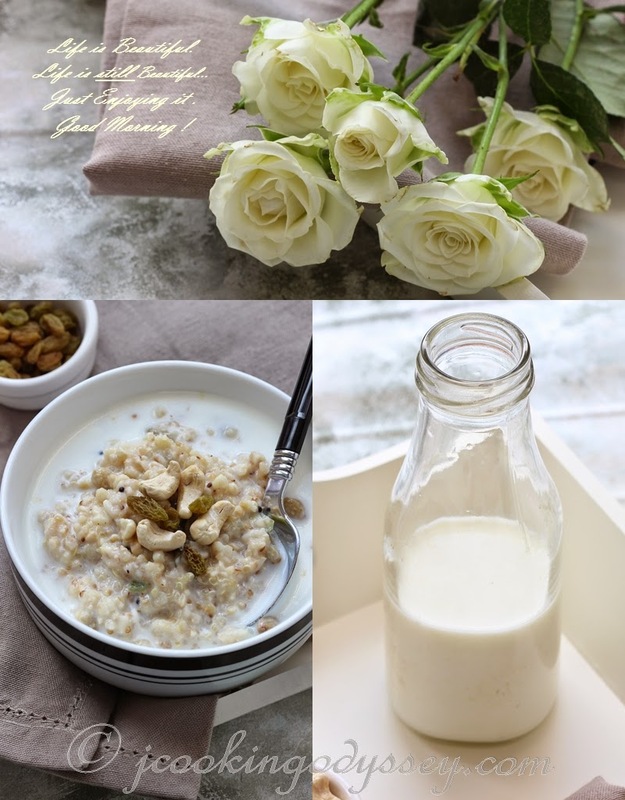 Jagruti's Cooking Odyssey: Steel Cut Oats, Quinoa , Bulgur wheat savoury porridge with Buttermilk ! Steel Cut Oats, Quinoa , Bulgur wheat savoury porridge with Buttermilk ! I am a breakfast snob, I think yes I am. I have set a very high standard when it comes to breakfast time for my family.
" Breakfast like a king, Lunch like a prince , Dine like a pauper " This ancient proverb has more than a grain of truth in it. Listen to any health expert, they will never fail in repeating this line and more often than not encourage everyone, why starting your day with breakfast is so important. While I grew up in India, things were different for us. Neither me or my family gave any importance to breakfasts, for us dinner was the most important meal as everyone sits together and enjoy having delicious full meal prepared by mum. However opinions and habits changed when I settled in a new country, new environment and started to adopt new life style. I have learnt so many precious things and still learning, which I might have not seen or learnt if I was in India. Noticed that almost every European gives a damn to their first meal which is breakfast whether it was healthy or not as long as you fill your tummy with something after a night's sleep. For me it didn't take long time to get in breakfast routine. Over the years I still have the habits of ruling the breakfast time, as I don't want any of my family member to skip breakfasts and give up in dreadful craving for the biscuits or chocolate bars in the middle of the morning or reach out for a leftover pizza slice instead of wholesome breakfast. If it's needed I do not give a second thought of waking up early and cook any kind of breakfast for us, I have prepared huge amount of Indian and continental breakfasts over the years, may not be healthy though always ! Now that I have fallen for complex carbohydrate and protein breakfasts, encouraging my family to tuck in too. All of complex carbohydrate and protein breakfasts provides so much healthy calories, real energy and brain activity food. A bowl of freshly made Steel cut oats, Quinoa and wheat porridge with water, topped up with calcium enriched buttermilk, nutritious spice and handful of luxury cashews and raisins, accompany with fresh fruit, and really you will have a breakfast fit for a king. This multigrain porridge will give your whole morning slow releases of energy which helps in controlling sugar levels , so little fat and plenty of peace when you are having a stressful morning either at home or out. I have been preparing this porridge almost a year now minimum once a week, we all get together at the breakfast table and enjoy tucking into a bowl of this porridge, and sometimes we don't mind second helpings - I'm at peace with the world !! 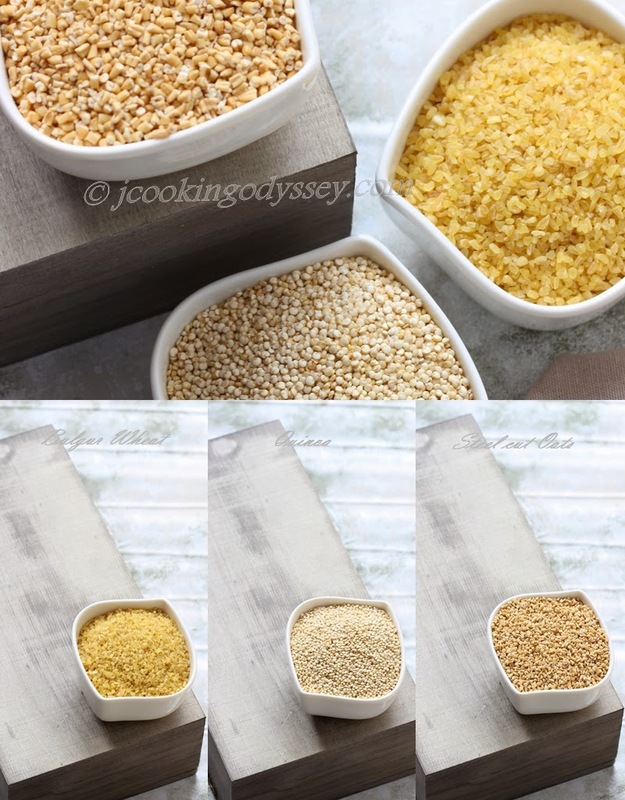 On a previous night lightly roast oats, quinoa and wheat in a heavy based pan for 3-4 minutes. Add one and half cup water cover with lid and leave it aside. In the morning cook oats, quinoa, wheat and salt in a pressure cooker with soaked water till 2 whistle. Make butter milk by whisking milk and yogurt together till you get smooth drink, if it's too thick add couple of tbsp. water. Heat oil in a small pan, add mustard seeds. Let the mustard seeds splutter, add curry leaves, crushed ginger chillies, cashews and raisins. Cook the mixture about half a minute and pour over cooked porridge. Mix porridge and serve in an individual bowl. 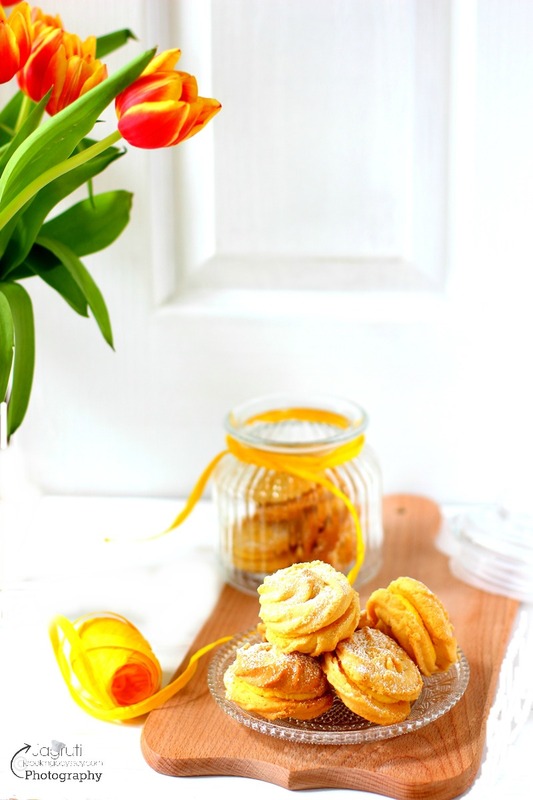 Pour buttermilk, mix and enjoy the healthy yet delicious breakfast. This looks amazing, I would never think to add quinoa and bulghar to my breakfast. So inventive - I really have to try this. That sounds really different and healthy; I've never tried porridge made with anything other than oats or cornmeal before, I'm going to have to give it a try! This looks fantastic! 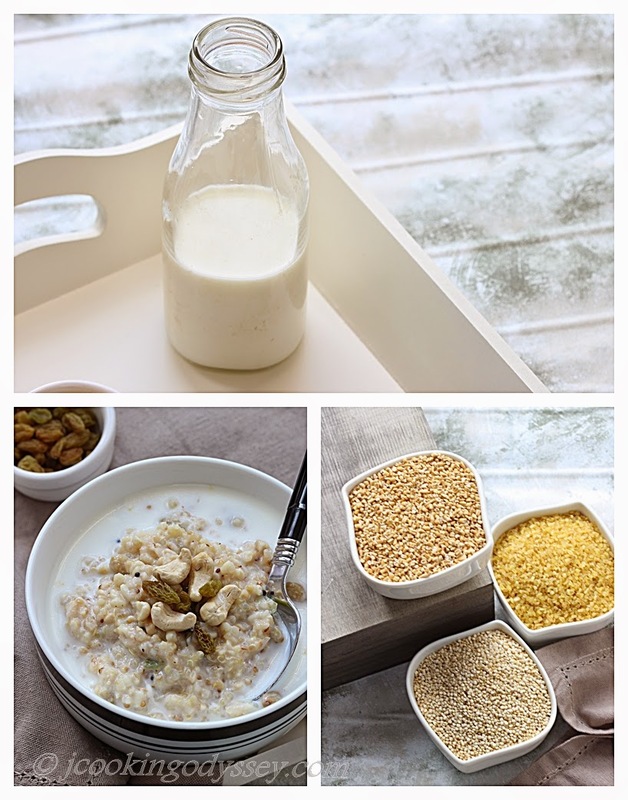 I start every day with porridge, but I've never tried it with any other grains; I need to give this a try out, I'm always looking to switch breakfast up and this looks like the perfect way to do that! These photos are gorgeous! I love the quinoa and blughar combination! What a great combination of grains for breakfast! I just wanna dig right in!! I admit when I saw the title I wasn't excited about the recipe, but after reading through the ingredients, this sounds like a great meal! This would be perfect for an after workout meal. Also, your pics are beautiful! This all looks so good! I love how versatile these options are for breakfast. Thanks for sharing. I can't wait to try! I'm a breakfast snob too and love grains! This is such an interesting flavor combo and I never would have thought to put this together. Must try! I always eat breakfast, but am still guilty of making dinner my largest meal. Your porridge looks delicious! I love cashews.